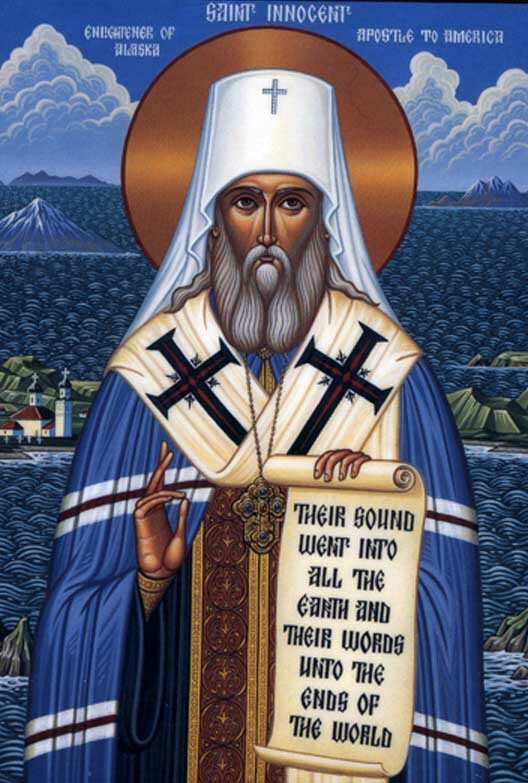 Today is the feast of St. Innocent of Alaska, also known as Equal-to-the-Apostles and Enlightener of Alaska. He was born in the Irkutsk region of Russia where he studied at seminary. He married, became a deacon and later a priest. When missionaries were needed to go to Alaska, he and his family volunteered. After arriving in 1824, St. Innocent realized he had a gift for languages and shortly mastered six of the local dialects and even translated the Gospel according Matthew into the most wide-spread dialect — the Unagan of the Aleuts. After his wife died, he was tonsured a monk and ordained as a bishop. Eventually he was elected as the Metropolitan of Moscow in 1867. He died 12 years later in 1879. This marks the third Saintly Saturday post dedicated to various American saints who made their mark in Alaska. Each time, it has inspired me to work a little more on one of my Gamer ADD projects — a fantasy campaign world based upon this period of Alaska. A fantasy setting set in 18th century frontier Alaska, unfortunately, needs to have firearms. Both colonial powers involved in this region of the world rely heavily on black powder. Therefore, I need to come up with a way to make them interesting without overpowering them; however, they will be much more expensive than standard weapons (I am thinking by a magnitude of around x10). The main way I intend to simulate firearms is to have armor reduce damage rather than making a PC harder to hit. What is traditionally called AC will, in fact, be a target number based on a PC’s Dex score. Heavier armors reduce the maximum effective Dex score — plate armor will make you easier to hit, but tougher to damage. Firearms don’t do any extra damage; however, they can ignore DR depending on the size of the weapon. This realistically simulates why armor eventually gets abandoned. At the moment, I am inclined to not include shields because they had largely fallen out of use by this time. Since this world does involve touchy subjects like colonialism, nativism and a missionary church, I am much inclined to dump the traditional D&D alignment system for one that harkens back to the days of Chainmail. In other words, there will be three different sides that PCs can choose to align themselves with — Ruthenia, with its claim to be the Third Rome and their close association with the Church (roughly akin to Lawful); Albion, with their claim to be the most powerful empire in the world, mostly due to their use of arcane science and possibly a few demon pacts along the way (roughly akin to Chaos); and the Natives who may or may not cooperate with the two colonial powers (roughly akin to Neutral). Since this setting sits at the cusp of the industrial revolution, I want all magic to have a pseudo-science feel to it. Arcane spells are akin to devices powered by hellfire or bound demons. Divine spells are akin to objects powered by the breath of angels. Native magic will be akin to alchemy using the natural ingredients passed down through the generations. Found magic will most likely be ancient alien technology. This may have some significant affects on how spells function. For example, I am inclined to have CLW function as it did it 0e — it takes one full turn to “cast.” Rather than being a miraculous healing during combat, it is the bandaging up with various medicines after combat. There will be humans only; however, that doesn’t mean I won’t be using the race-as-class abilities of demi-humans — they’ll just be recast as humans (see below). I am seriously considering having different versions of each of the three core classes based on alignment. I say three because I don’t want to mess with the Thief. I am inclined against the class in the first place and (at least at the moment) can’t think of a good way to make it fit thematically. Ruthenian Demonhunter — less emphasis on healing spells (see the implementation of CLW above) and more emphasis on fighting (leaves a lot of room for non-clergy PCs). Native Medicine Man — uses the druid spell list, representing local knowledge of natural phenomena and tricks. Ruthenian Haykar — a mad scientist-type that sees theology as the mother of sciences. Instead of a spell book, they would have several one-use devices that could then be repaired/reset. Native Windweaver — uses the illusionist spell list, representing an intimate knowledge of local hallucinogenic plants and techniques to mislead and obfuscate. Albiones Battle Mage — this is where I get to the use the elf race-as-class recast as a human playing with hellfire. Ruthenian Grenadier — this is the dwarf recast as human. Grenadiers are basically the biggest and toughest infantry men used to fighting in the trenches and functioning as sappers during siege combat. Native Hunter — some version of the ranger (which one I have yet to decide). Albiones Musketeer — this is the halfling recast as human. These are soldiers imbued with hellfire in order to make them tougher and better marksmen (remember, Halflings get +1 with missile weapons). This also limits their potential (the reason they only get to go to 8th level). So, this weekend (appropriately on April 1), Google is forcing me and everyone else who blogs using their service to switch to a new interface. In the past, they have invited me to try this new interface and I have found that it does all the things the old interface did, only less efficiently (especially if using a tablet), and have therefore not willingly stuck with the change, preferring the old interface because it works really well for what I want to do. As far as I can tell, the only reason to do this massive change is in order to do a massive change. In the meantime, I have to put up with all the bugs, all the extra button pushes and no guarantees that I will be able to be as effective as I have been since starting this blog. Call me a grognard, a stick-in-mud or a Luddite, but I live by the adage: If’n it ain’t broke, don’t fix it. Change for the sake of change is a recipe for disaster. This got me thinking about the advent of 5e (especially in light of the delay for the arrival of the 1e reprints). When it comes to RPGs, no one can accuse me of being some kind of reactionary. The whole purpose of this blog is to change the relationship RPGs have with religion. I’ve also done plenty of tinkering with my own game (weapon vs. AC charts anyone?). The reason for these efforts is because I see something that is broken and have endeavored to fiddle to see if anything works better (nothing so far on the weapon vs. AC charts, unfortunately). Largely, however, I am very satisfied with the game I have been playing for the better part of thirty years — because it works. This is one of the reasons why I have not paid much attention to all the various happenings with 5e, other than here’s to hoping I can be a customer of WotC again when they reissue parts of their library that I’d be interested in purchasing. It is here that I have to ask the question: Is 5e really necessary? Is WotC changing for the sake of change, or is there really a problem that needs to be fixed? I will grant that WotC does see a problem — the hobby is very balkanized with plenty of people out there who happily put on the edition warrior helmet. There are also a whole segment of the hobby that is happily spending their money on products not produced by WotC. These problems, however, are not mechanical problems, they are people problems. As I see it, no amount of mechanical fiddling, or mechanical change for the sake of mechanical change is going to solve the fundamental problem of a balkanized hobby. Rather, what will fix the problem is how WotC treats the people who do this hobby. This is one of the reasons why I see the reprint of the core 1e rules as a huge step in the right direction (and hope the delay is due to trying to meet a larger demand than expected), even though I am not sure I am going to be able to purchase them myself. With this small act, WotC is officially recognizing the history of the game and acknowledging that there is no one official way that the game must be played. To my mind, if WotC is interested in bringing our hobby together in one big happy family, then the best way to do that is to make every edition of the game official and make every edition available either through reprints or POD. This game has been successful in every iteration because so many of us have had fun with them — 0e all the way through 4e. Don’t fix what isn’t broken — give us all the freedom to officially play the version that best suits us and purchase those supporting materials that help us play that version. Those who have read my blog know that I am a big fan of geomorphs. 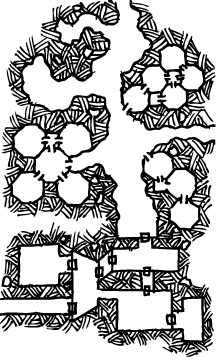 They are a fantastic tool for coming up with dungeons on the fly — especially those with a distinctly old-school flair. There are those, however, that balk at the seeming "uniformity" of maps generated by such a method. 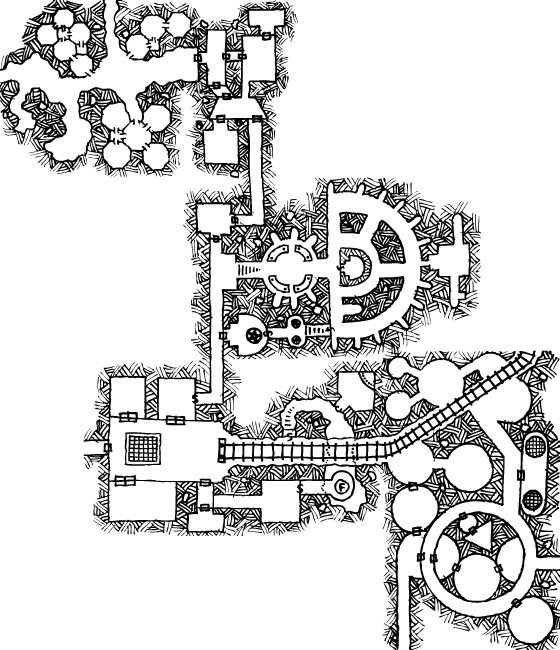 Since essentially all of the geomorphs over at Dave's Mapper are 100' x 100' all of the maps tend to be the same overall shape, even though the interiors might be radically different. 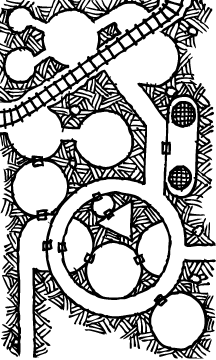 Enter the map I stitched together of maps drawn by Dyson. There have been a lot of positive comments about it. One that jumped out at me was that it seems more organic than other types of maps (the blocky nature of geomorphs, for example). This got me thinking of another way to implement the geomorph concept while getting a more organic outcome. Most of the maps I used to generate this map were originally on 3x5 index cards. 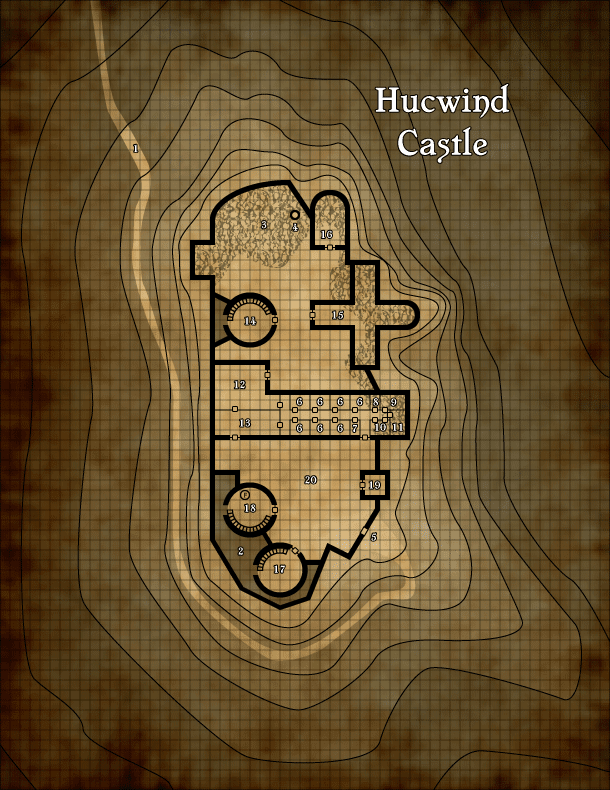 What if mappers out there produced a slew of 3x5 map areas with one or more ways to connect their map to other 3x5 maps. Here's the kicker: don't use a graph grid and don't worry how or where the connection happens. The result will be that the 3x5 card can connect, but not necessarily in a block — it creates a greater possibility to produce organic looking maps. Though not as organic as my inspiration, I don't think anyone could accuse it of being blocky. This being my first attempt, one thing I would do in the future is avoid getting too close to the edge of the card save for one or two rooms. Anybody out there willing to take up the challenge? Earlier this week, Stuart of Strange Magic posted a very nice version of the paladin/anti-paladin for Basic D&D. Stuart does an excellent job of delineating several of the historical problems with the class and then elegantly deals with each of them. There is one problem, however, that Stuart does not address — my main beef with the class. The holy warrior already exists. It is called the Cleric (though I really do like Stuart’s version of the anti-paladin as a stand-in for a non-druidic anti-cleric). Still, I find Stuart’s version of the paladin really inspiring. Surprisingly, the factor that was most intriguing to me was the limitation No Ranged Weapons. I say this because this limitation is a natural companion to the limitation I placed on my Holmesian version of the Ranger, which is limited to only ranged or thrown weapons. Leadership. Paladins have a floating +1 bonus that may be given once per combat round to one other PC as a bonus to hit, to damage, to AC or to a saving throw. The only time the paladin can use this floating bonus on themselves is in conjunction with the Defender skill (see below). If the paladin has a Charisma of 13+ the floating bonus is +2. This then may be split between two PCs if desired. Tactician. Once per combat round, a paladin can interrupt the normal initiative order. Before an action is taken by another PC or opponent, the paladin may switch places with them in the initiative order. Defender. By forgoing an attack during a combat round, the paladin may force an opponent to attack the paladin rather than another PC. While doing this, the paladin gains +2 AC and may use the floating bonus (if it hasn’t already been used that round) to add to this AC bonus. Note that the Tactician skill assumes the initiative rules found in Holmes, which has a static initiative order based on Dex. Note also that there is no longer an alignment restriction (although these skills do make much more sense within the context of a Lawful alignment). Today the Orthodox Church celebrates the Forefeast of the Annunciation. When I began to really study the liturgical year of the Orthodox Church, one of the things that really caught my attention was the fact that the Orthodox have two modes of worship — anticipation and celebration. A classic example is Great Lent and Pascha (Easter). We fast for forty days in anticipation of Pascha and then celebrate the Feast of Feasts for forty days. This mode of anticipation is so strong that we see the concept of the Forefeast — we begin to celebrate before we celebrate. Since tomorrow is the Annunciation — when Gabriel comes to the Virgin Mary to announce that she will bear the Christ Child in her womb — and since it is one of the great feasts of the Orthodox Church, today is a blend of both celebration and anticipation. Sarah, wife of Abraham, gives birth to Isaac (Gen. 16-21). Rebekah, wife of Isaac, gives birth to the twins Jacob and Esau (Gen. 25). Rachel, wife of Jacob, gives birth to Joseph and later Benjamin (Gen. 30). Samson’s mother was barren until she saw a vision of an angel (Judges 13). Hannah, wife of Elkanah, gives birth to Samuel (1 Sam or 1 Kings by LXX reckoning). As a fascinating side note, the Song of Hanna (1 Sam/1Kings 2:1-10) mirrors the Magnificat of the Virgin Mary (Luke 1:46-55). The extra-biblical account in the Protoevangelium of James (which mirrors the stories associated with the Orthodox feasts of the Conception (Dec. 9), Nativity (Nov. 8) and Presentation at the Temple (Nov. 21) of the Virgin Mary) sees Anna, the mother of the Virgin, barren and well beyond childbearing age when she becomes pregnant with Mary. This pattern, however, is broken with the Annunciation. Note that Mary was “deeply concerned” and she asks of Gabriel, “How can this come about, since I have no knowledge of man?” The anticipatory pattern highlights the uniqueness and importance of the Annunciation — Mary is not only the mother of a child of promise, she is the Mother of God Incarnate. I highlight this idea of anticipation because I see it as a tool we can use to create truly memorable moments within a campaign, if not memorable campaigns in and of themselves. My most rewarding moments as a player and as a referee were set-up long before hand by laying an anticipatory foundation. When I was in high-school, I was involved in a campaign with twelve(!) players that saw the party investigating strange occurrences within the realm. As the campaign wore on, we discovered that these were due to a breakdown in the walls between the PCs reality and one of the realms of the Abyss. Though we went on several different kinds of adventures, this was always part of the background noise. The memorable moment was when the party finally found the source of the breakdown and the battle that ensued as the PCs did what they could to shut it down. All the normal D&D stuff — heroic deaths, well timed natural 20s, etc. — were heightened because this was a battle for which we had been preparing since being level 1 nobodies. My favorite moment of my Lost Colonies campaign was the reveal of a Brain Lasher. From the very beginning of the campaign, I had dropped hints that my favorite Cthulhu-inspired monster was operating somewhere in the background. Therefore, when my party realized that all those hints and rumors were not only real, but standing right in front of them, their reaction was priceless. It was a reaction made possible because of anticipation. Note that some of the things these hint at will never come to fruition — and that is okay; however, when they do, it makes our celebration of these events (when we retell our adventures and/or reminisce about them) all that much sweeter. I will end with a question: What are some of the ways anticipation has been achieved in the campaigns you’ve played? For those interested (and to give Dyson proper credit), the originals are here, here, here, here, here and here. I used the dungeon stocking table from Moldvay with one addition. 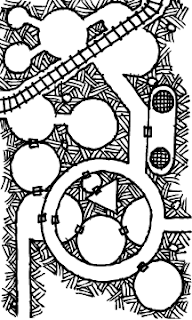 Holmes provides a table that allows wandering monsters from tables above or below the current dungeon level. Since I had WMTs for levels 1-3, I wanted to take advantage of them all and so utilized this table from Holmes. 57. Footpads (lying in wait to backstab those in combat with the Veterans in 63). The fun part of this whole exercise is that this dungeon doesn’t feel all that different from a classic sample dungeon for a Basic Edition — its a pair of Magic Users who employ some evil humans and humanoids as guards. However, all the various familiar elements are twisted just enough to be unfamiliar and therefore dangerous. I especially like how the demi-human stand-ins (Dakon, Kenku and Quaggoth) don’t necessarily seem out of place or are automatically an encounter that will help out an adventuring party. 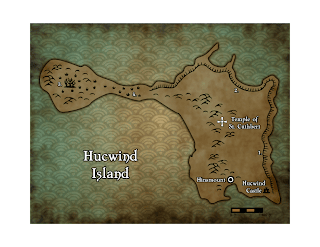 Notes: The castle is meant to look like an abandoned ruin; however, there are clues for the astute adventurer that there is something horrific going on within. The path that leads to the castle has been deliberately hidden and obscured; however, it is so well-worn that anyone who is actively looking for it can find it. All of the surviving structures of the castle are only one story tall — everything higher has collapsed. The only stable construction at the second story are the two areas around the towers. This is, in part, due to some reconstruction of these platforms and of the upper section of the wall. Dwarves and gnomes can spot the new construction on a roll of 1-2 on a d6. This new construction on the outer wall hides a series shallow pit traps which hide steel spikes coated in poison from the sting hounds. The spikes will do d3 damage, but the poison is weak. It isn’t effective on a 1-2 on a d6 and even if it is, the saving throw is made at +2. Rubble halves movement rate and takes twice as long to search. Wandering monster checks are also doubled, with a 1-2 on a d6, where a ‘2’ indicates giant centipedes. This is an old well. It is one of two entrances into the dungeon below. The gate (which is really a large oak door) has been distressed on the outside to look old and weathered; however, it is new and the interior is reinforced with steel. It is barred from the inside and cannot be opened from the outside without breaking it down. 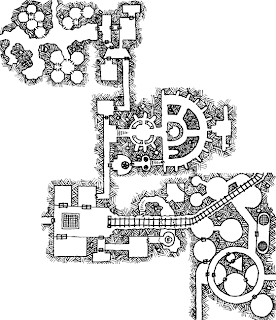 These were once monastic cells and are now rooms used by kuo-toa hybrids/sea bloods that either are well along in becoming full blooded kuo-toa/deep ones or had something go wrong with their creation. Therefore, none can easily pass for human. They guard the castle from intruders and will use nets, man catchers and lochaber axes in combat. They will try to capture intruders in order to interrogate and possibly enslave. This was once the room of the abbot, it is now used as a storage room. This was once a storage room. The ceiling has collapsed. This was once a guest room. The ceiling has collapsed. This was once a monastic cell. The ceiling has collapsed. This was once a library. The ceiling has collapsed. Should a party wish to spend the time, they can find 1d3 books in decent, if damaged shape as well as a clerical scroll. This was the dining hall and is still used as such. There is a podium from which scripture was read during meals. This was a kitchen and is still being used as such. This tower is home to a large mutant half-breed and his pet sting hound. This was once a chapel. Most of the roof has collapsed. Should a party wish to spend the time, they can find 1d6+1 Beads of St. Cuthbert. This was once a guard house. The roof has collapsed. It is now a nest for giant centipedes. This guard tower functions as a kennel for sting hounds. There will always be 1d6 present. This guard tower is occupied all the time by 1d6 hybrids/sea bloods. The trap door in the floor leads to the dungeon below. This used to be a gatehouse, of sorts. It is now the home of an ochre jelly that the hybrids/sea bloods feed with various failed experiments. This open area is always watched by 1d6+1 hybrids/sea bloods along with at least one sting hound. They are very good at using the natural shadows to hide. They will thus surprise a party on 1-3 on a d6. Today is a convergence of two significant events, at least for those of us of an age who dabble in this singular hobby of ours. I am in good company with those who were introduced to the world of RPGs by Dr. Holmes’ edition of D&D. Today, of course, marks the anniversary of his death. How apropos that today is also the feast day of St. Cuthbert, that oft misunderstood saint who has been with us as part of our hobby since he was first mentioned in passing in Supplement 3: Eldritch Wizardry. Since I have been dabbling with re-imaging the Slave Pits of the Undercity on an island once occupied by the followers of St. Cuthbert, I have been doing some research on various relics that might show up somewhere within the confines of the Temple once dedicated to the saint. There are two that inspire (sorry, neither of them are a mace). One is unique and the other is a type of item that could potentially be found or made in greater quantity. In honor of today’s feast and today’s loss I’d thought I would share. 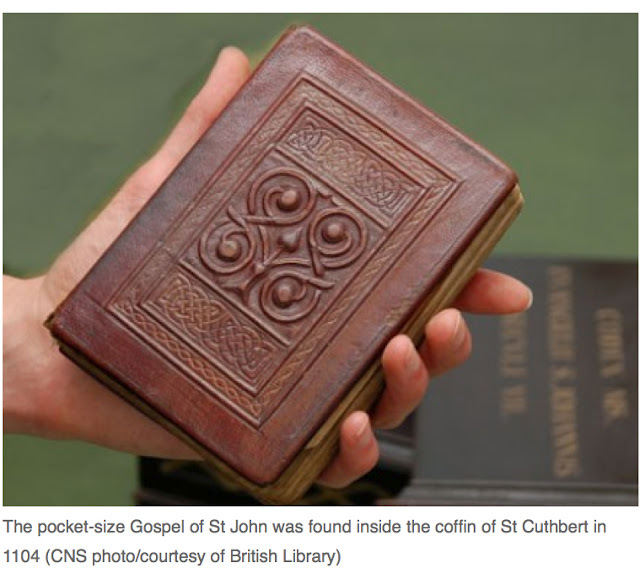 For hundreds of years, the body of St. Cuthbert remained incorrupt. There are multiple accounts about how his joints were still subtle and how the items found on his body were as fresh as the day that they were made. One of these accounts noted that when his tomb was opened in 1104, therein was found a pocket-sized Latin translation of the Gospel According to St. John, which is now in possession of the British Library. In a campaign that includes St. Cuthbert, this relic could miraculously produce pages within that function as cleric scrolls. When used to pray for spells, St. Cuthbert’s Gospel Book produces a number of spell-pages equal to the number of spell levels the praying cleric can cast. These spells are determined randomly and will remain until cast appropriately. Only one page per spell level will appear within the book. The monks of Lindisfarne would make prayer ropes, necklaces and rosaries from crinoid fossils — the stalk of ancient sea lilies. These would either wash ashore or be exposed in the rocks around the island. The monks believed that St. Cuthbert would forge them out of the rocks at night so that the monks could find them the next day. 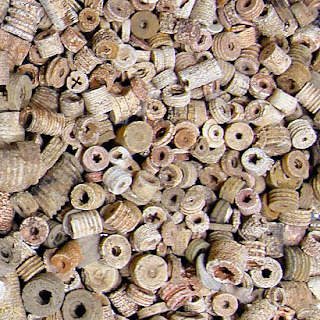 They came to be known as St. Cuthbert’s Beads. On a rock by Hucwind, St. Cuthbert sits, and toils to frame the sea-born beads that bear his name. If one or more is in the possession of one who recites this prayer, they will be the recipient of a Sanctuary spell. This may be done three times per day and the spell lasts one round for every bead strung together on a prayer rope or necklace. 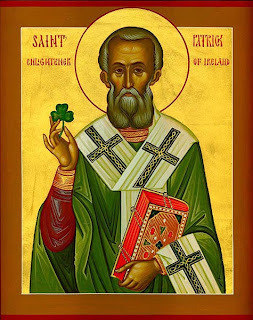 Unlike so many other of the feast days that I have written about, today is a feast that is not only widely recognized outside of the Orthodox Church, but might be seen as anything but an Orthodox feast — St. Patrick’s Day. Also known as the Enlightener of Ireland, Patrick was born about the year A.D. 385 in Roman Britain, in a village called Bannavem Taberiae (possibly at the mouth of the Servern River in Wales). His was a Christian family (his grandfather was a priest and his father was a deacon). At the age of sixteen he was captured by marauders and sold into slavery in Ireland. During the next six years, he not only learned the Irish language but learned to take great solace in prayer — something he would come to do up to a hundred times a day as he wandered the mountains as a swineherd. Subsequently, he had two visions: one telling him he would go home, the other telling him that his ship was ready. Therefore, he escaped, walked some two hundred miles to the coast, where he boarded a ship and was returned to his family. His experience had stoked a fire within, however, and he was soon off to Auxerre in Gaul to study to be a priest under the tutelage of St. Germanus. Eventually, he was ordained and sent to Ireland around A.D. 432 to continue the work of missionaries that went ahead of him. Due to his familiarity of the culture and language, he was very successful (thus the monicker Enlightener of Ireland). Eventually (around A.D. 444), he established a see in Armargh. He died on March 17, 461 (or 492 depending on the source). One of my favorite stories of St. Patrick is his use of the shamrock leaf, something he is often depicted as holding. He used it to help explain the doctrine of the Trinity — three persons (represented by the leafs) in one essence (represented by the stem). Modern English speakers might be tempted to say that the shamrock is a symbol or symbolic — it is a substitute or metaphor for the Trinity. Interestingly, from an Orthodox Christian perspective, this is an incorrect understanding of the word symbol. It comes from the Greek συμβάλλω, which means gather/meet/join together or more literally to throw together. From a religious perspective, the two things joined or thrown together are the mundane and the divine. In this sense, the Body and Blood is a symbol — from the Orthodox understanding it is both the mundane (bread and wine) as well as the divine (the presence of Christ Himself). A Cloak of Protection allows for a guardian angel to physically manifest protective wings around the wearer. A Ring of Invisibility has an Invisible Stalker bound to the ring. A Helm of Telepathy has some kind of psionic creature bound to it. Would a Cloak of Protection work for someone who is actively working against God and His Church? What happens to a character who subjects themselves to either the Ring of Invisibility or Helm of Telepathy for long periods of time? Can the bound creatures ever escape and how much can they affect their bearers to provide them the means to escape? If the Helm of Telepathy has a vile or cunning psionic creature bound to it (such as a Brain Lasher), is the information gathered by the Helm 100% accurate? Suddenly, every single magic item can have a backstory that can be explored and have an impact on the campaign as a whole. I will grant that this is not necessary for every magical item to work this way, but even the presence of just one or two can shape an entire campaign. This WMT has a distinctly elemental feel to it. One of the reasons I chose the Thoquua as a construct was that it fit very nicely with the elemental theme. The one element that stands out is fire. Firenewts, Fire Mephits, and Firedrakes all have breath weapons. Thoquua and Lava Children have heat-related powers that can render various items useless. Another observation: there are a lot of multiple and special attacks on this list. PC parties better be ready to be creative because going toe-to-toe with this list of creatures is not a recipe for long-term success. 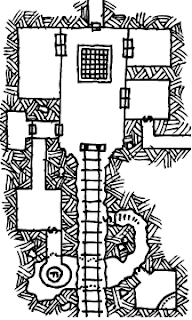 If there isn’t an easy way to the surface from the third level of a dungeon, even one combat could place a party in danger of a TPK just trying to get out. This is a continuation of what I started yesterday. 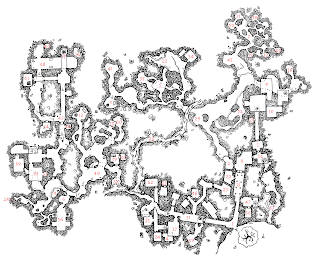 Although I am itching to stock a dungeon with yesterday’s Wandering Monster Table (WMT), I am going to hold off until I complete all three levels of WMTs that would be found in a FF Basic Edition. In his advice for stocking dungeons, Moldvay suggests that there always be at least a couple of encounters that are placed rather than randomly determined. For these encounters, I like to look at and even roll on WMTs a level or two higher than the current dungeon level — a strategy akin to making them “boss” encounters. I will continue my strategy with humans — use classes and indicate level using level titles. A number of other challenges arise due to the variety of monsters in the FF. Undead are scarce, thus the Coffer Corpse will make a second appearance on Level 2. For a similar reason, Kenku will also make a second appearance; however, with the extra HD comes spell use. Therefore, they are not quite the same. This is also true of the Garbug — Level 2 will see a stronger variety of this strange arthropod; however, one thing that I am beginning to notice about the FF is its dearth of insects. Yes, they do exist, but while traditional D&D monster sections have a good variety of insects that populate a number of HD ranges, the FF is spotty at best. One strategy might be to take a lower HD insect and increase the number encountered; however, I like more variety. In a strange way, this table feels a little more familiar than the Level 1 WMT. The humanoids, while still very different from your everyday run-of-the-mill orc, are still somewhat familiar. Norkers are akin to hobgoblins. Flinds are a variety of gnolls. Ogrillons are literally a cross between orcs and ogres. Even the strange looking Qullan remind me of the type of berserker I’d expect to see two levels down in a dungeon. 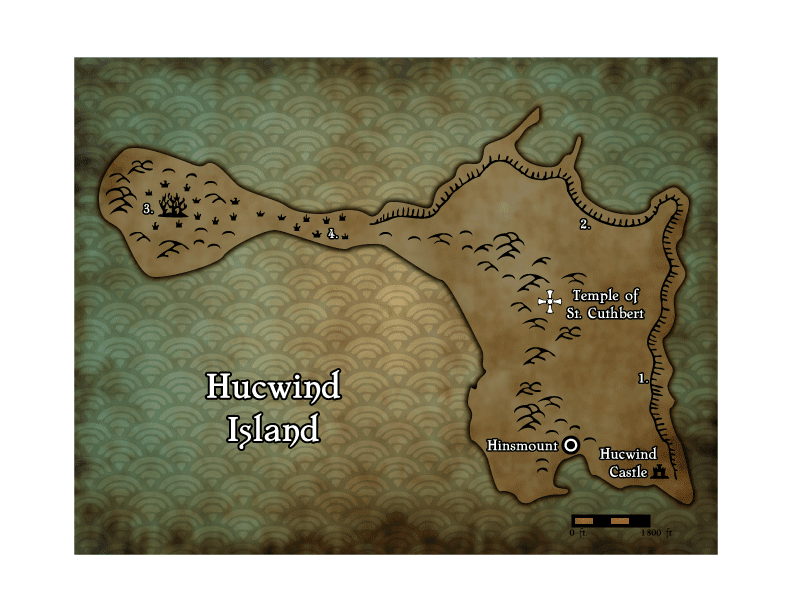 Among the other members of The International League of Fiend Foliasts, Chris of Vaults of Nagoh has already done an analysis of the Wandering Monster Tables (WMT) in the FF. I am not here to duplicate his work, rather I want to refashion the WMTs of Moldvay’s Basic Edition using FF monsters. It is actually quite surprising how easy it is to find a number of choices to fill many of these categories. In particular, flyers and humanoids with similar HD are in abundance; however, creativity is necessary in order to fill the human and demi-human slots since the FF has no entries for humans (no bandits, berserkers, traders, etc.) or traditional demi-humans (only drow and svirfneblin). I am going to take a page from Holmes here, and place classes for each of the human slots using level titles. For the demi-human slots, I will use my substitute demi-human race-as-class examples here. The biggest problem is the slime/ooze slot. All the various creatures in the FF that qualify for this category have much higher HD. If, however, one considers a slime/ooze to be akin to a plant, I figure a Yellow Musk Zombie could be an interesting substitute. Overall, I think this list is a tad more frightening that the one found in Moldvay (one is more likely to get poisoned, ambushed, used as a reproductive host and/or have your treasure stolen). Running away must necessarily be part of an adventuring party’s repertoire (not a bad thing, actually). I am going to break pattern today. Although it is the feast of St. Quadratus and his companions who were martyred at Corinth, Conrad of Joy and Forgetfulness asked me this week for my thoughts on the Archangel Michael. The name Michael means like unto God or Who is like unto God? As I mentioned when I wrote about the Archangel Gabriel, the word angel means messanger. This is indicative of one of their primary purposes, exemplified by Gabriel who is the messenger par excellence; however, angels also protect — as indicated by the existence of guardian angels. Michael is the protector par excellence. Chapter 10 of Daniel where he helps to defeat the Persians. Chapter 12 of Daniel it is revealed that he will appear in the end times to protect the people. St. Jude in his epistle mentions that Michael battled the devil over the body of Moses (1:9). In Revelation (12:7-9) he battles Satan and his angels and hurls them down to earth. neither…but as the commander of the army of the Lord I have now come. This is the origin of his title Archstrategos or Chief Commander. The pillar of fire and pillar of cloud that led the Israelites from Egypt. The destruction of the 185 thousand soldiers of Sennacherib the Assyrian emperor (4/2 Kings 19:53). The smiting of Heliodorous (2 Macc 3:24-26). The angel that transports Habbakuk from Judea to Babylon in order to give food to Daniel in the lions’ den. (Bel and the Dragon v. 33-39). On the Greek island of Symi there is a miraculous icon of the Archangel that has a pair of traditions associated with it. Michael is known to grant favors of those who ask, though something must be given in return. The most popular choice is that of a broom. The monks of the monastery report that they often hear the archangel using these brooms to sweep the monastery at night. Those that ask favors but do not offer anything, the archangel will let you know of his displeasure. This most often manifests as the inability to leave the island. Any boat that one tries to leave on will be unable to sail/the engine won’t start until the offering is fulfilled. People will place prayers to the Archangel in bottles which they then throw into the sea. These messages end up in the harbor where the monastery is. They have thousands on display. 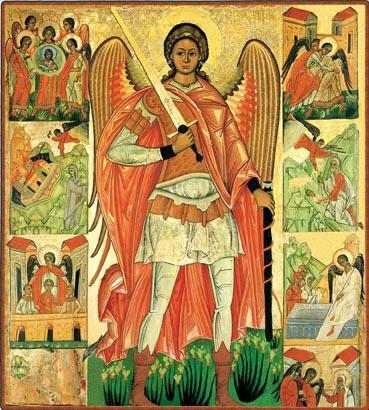 According to the Hagiography of St. Mercurius, the archangel appeared to the saint to give him his sword. The Archangel Michael is actually one of the reasons that I feel completely comfortable with the idea that D&D is compatible with Christianity. Often depicted in armor and wielding a sword or a spear, Michael is a reminder that the life of a Christian is spiritual warfare. We are constantly being assailed by temptations and, from an Orthodox Christian perspective, the devil and his angels. Every day we must gird ourselves with the Lord and go into battle, because sometimes the spiritual bleeds into the physical (just ask St. Quadratus and his companions). As I have stated many times before, FRPGs and D&D (in its older forms in particular), make excellent metaphors for this spiritual warfare. Monsters are sins personified. Demons walk the earth in physical form. PCs represent (Christian) Civilization as it goes to battle with the (Demonic) Wilderness. Of particular interest to me is the endgame of (older editions of) D&D. PCs are expected to carve out a piece of land, clear it out and build a stronghold — reclaiming a portion of Wilderness and making it safe for Civilization. This manifests, in game form, the great reclamation project of Christ and His Church. Christ did not become a human being just to save humanity, He came to save all of creation. As His royal priesthood, the Church endeavors to sanctify and restore creation — to properly orient it towards God. 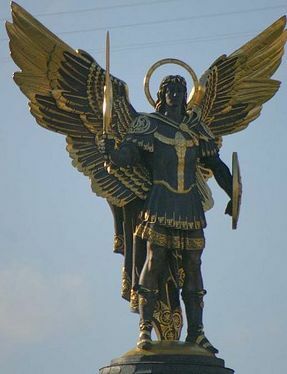 In his role of protector and his multiple battles with the devil and his angels, the Archangel Michael personifies this aspect of D&D. An aspect I continue to explore and present in both this blog and the way I play the game. Though these brooms appear to be normal, mundane items (although many might have a cross carved in the handle), they radiate of divine magic. They may be used to ask favors of the Archangel. Whenever such a boon is requested, two dice are rolled instead on one for the next roll a player makes. They are then allowed to take the result of either die. This boon, however, requires an offering. Most often, the broom itself is offered and in such cases it will turn to dust. Other offerings may be made it the broom’s place. Anything of value (a level to be determined by the Referee) may be substituted. Such substitutions will turn to dust. If a boon is asked, but no offering is forthcoming, the player must roll two dice for everything and choose the most detrimental result until something is offered. Most of the houses are actually the hulls of ships flipped over onto the foundations of what remained of Hinsmount after the pirates/humanoid raiders destroyed it. Unlabeled houses are the homes of fishermen. The small homes will house 1d2 halfbreeds/sea bloods. The larger homes will house 1d4+1 halfbreeds/sea bloods. These will be unoccupied most nights (when the fishermen go fishing or are involved in rituals at the castle). The beach area (the dark band next to the water) has scores of sticks shoved into the sand. When they aren't using them to fish, the boats of the village are tied down to these sticks. Farmers: These halfbreeds/sea bloods maintain some sad looking fields north of the village. They work their fields during the day; therefore these buildings will be occupied at night. Storehouse: This is a catch-all storage place for the village. Farm implements, broken fishing equipment, wood and other fuels for the smokehouse can all be found here. Shed: This is a storage area used by the fishermen for various items they use while fishing like nets and hooks. Net makers: These homes house the halfbreeds/sea bloods that make and repair the nets (both those used by the slavers and those used by the fishermen). They tend to work during the day, but are otherwise almost always found in these buildings. Kennels: These buildings are used to house the "sting-hounds." These creatures are one of the successful experiments by the kuo-toa/deep ones. They are a combination of bloodhound and sting ray. They use their stingers to temporarily paralyze intruders or escaped slaves. At any one time there will be 1d8+1 sting-hounds here. Dog Handler: This is the house of the halfbreed/sea blood who trains and cares for the sting-hounds. He is a 3rd level fighter who prefers to use a whip or a net. He is normally patrolling the island at night. Chief Fishermen: This is the day-to-day leader of the halfbreeds/sea bloods. He is a 5th level assassin. Village Elder: This is who the village goes to for advice on issues the Chief Fisherman cannot resolve on his own. The elder is advanced in her devolution towards becoming a full-blooded kuo-toa/deep one. She is a 5th level magic user. Alchemist: This halfbreed/sea blood primarily gathers and processes herbs and ingredients used by the kuo-toa in their vile experiments. He does, however, keep a decent supply of healing salves, which are the equivalent of a potion of healing. There will always be 1d3 salves available. He wanders the island during the day looking for ingredients. He is a 3rd level magic user. Guardhouse: There will always be 1d6 2nd level fighters here guarding the beach. They are led by a 3rd level fighter. They are armed with crossbows and harpoons. Three stone buildings survived the pirates/humanoid raiders. One is used as a meeting hall for the village. One is used as a smokehouse where the fishermen process, preserve and smoke their catches. The last is used as a smithy, where various metal tools are made and repaired. There will be 1d3+1 halfbreeds/sea bloods at these three building at all times. 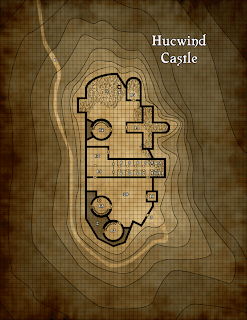 There once was a path from the village to the castle; however, the slavers do not want to call attention to the castle, as that is where some of their more vile experiments occur. They have, therefore, gone to the trouble of covering that path up. 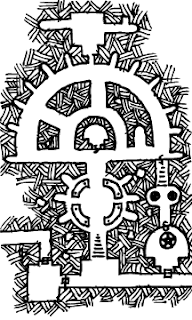 If a villager needs to get to the castle, they will likely get there using the underground tunnels carved by the kuo-toa. They are entered by either using a boat to go through the cave opening on the north side of the island, or via the old temple. When I was a kid and just learning to read what my children now call “chapter books,” I spent a lot of time in my local library perusing books in the mythology section. Of particular interest to me were stories from various Native American tribes. This was something I had yet to encounter and I found them both fascinating and horrifying. The one thing I vividly remember about these books was an illustration of the Spider Woman. Though not necessarily understood to be a monster, this illustration certainly made me think of her as one. Ironically, despite my fascination with this depiction of the Spider Woman, I have never been a big fan of D&D’s Spider Woman — Loth. This is, in part, because of her association with the drow, which I have always found . . . boring. This is, in part, because my childhood imagination was better than a bunch of dark skinned elves. The Spider Woman (and by extension Loth) imply the horrifying notion that creatures of the insect and arachnid worlds not only look completely alien, they are alien. They are manifestations of forces in the universe intent on destroying humanity — Cthulhu in an exoskeleton, in other words. I mention this because though there is a (short) list of creatures in the FF that hail from the lower planes, none of them invoke the hostile alien intelligence that my young mind saw in that illustration of the Spider Woman (and later in the writings of HPL). There is, however, one group that can — the grossly underutilized Slaad. Though their alignment is technically Chaotic Neutral, not only have I argued in the past that there is so little difference between Chaotic Neutral and Chaotic Evil that they might as well be the same, who could argue that the Lord of Entropy and the Lord of the Insane (the Slaadi Lords Ssendam and Ygorl) could easily be seen as despots of the lower planes? What sets the Slaad apart, however, is that they are basically all frogs. Slaadi do for amphibians what the Spider Woman does (and Loth ought to do) for insects and arachnids. They transform an entire classification of animals into an ancient alien menace determined to wipe out humanity. One of the things I really like about this understanding of amphibians is the way it plays with classic tales like the Princess and the Frog. In fact, I do believe there is an adventure in there somewhere . . .
As I predicted in my initial thoughts, this map is based on the island of Lindisfarne, the place where the real St. Cuthbert is from. It is approximately 2.25 miles wide and 1.5 miles deep. The castle is the oldest structure. It was built as a deterrent to pirates, a task at which it failed and was therefore abandoned. 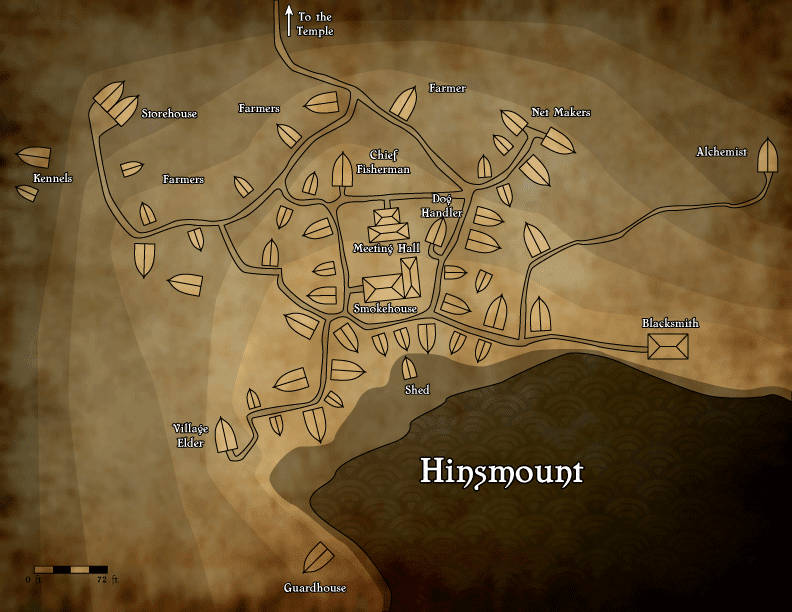 The followers of St. Cuthbert came to the island, rebuilt the castle as a monastery, founded the village of Hinsmount (also a rearranged reference to HPL) and the Temple. When pirates/humanoid raiders figured out that the great treasure on the island were bones (relics of the saint), they destroyed many of the buildings and killed every one on the island in order to make the whole endeavor worth their while. The kuo-toa/deep one slavers found a series of natural tunnels in the bowels of the island, which they expanded. Once they had enough half-breeds/sea bloods, they built on top of the foundations of Hinsmount and re-claimed the castle. There is a cliff wall along much of the northern and eastern coast of the island. On average it is about 50-60ft. high and is about 100 ft. at its highest point. There is a sea cave here only visible during low tide. It is otherwise completely under water. This is the normal entrance used by the slavers into the Slave Pit complex that are in the bowels of the island. This sickly looking copse of trees is the home to a group of ghouls. Whether they are the remnants of the raiders who killed all the followers of St. Cuthbert or the result of some of the vile experiments done by the slavers, no one is really sure; however, the slavers do keep them in decent supply of food — both to keep them happy and to dispose of bodies. At high tide, this area is underwater. During these times, there is a 50% chance that some of the ghouls from area 3. will be here hunting fish. By Orthodox Christian reckoning, today is the first Saturday of Lent. The Orthodox Church still uses the Julian calendar to figure out when Pascha (Easter) is, unlike the Western churches which use the Gregorian calendar. Thus, Pascha and Western Easter can fall at radically different times (there have been years when my Protestant friends are celebrating Easter and I am just beginning Lent). This year, the two calculations are off by one week. On the first Saturday of Lent, the Orthodox Church commemorates a miracle of St. Theodore the Soldier, a martyr from the third century. Some fifty years after his death, the emperor Julian the Apostate (A.D. 361-363 — a former Christian who tried to reinstate paganism as the state religion) wanted to create an uproar among the Christians. Therefore, he had the city-commander of Constantinople sprinkle all the food in the various markets of the city with blood offered to idols during the first week of Lent. St. Theodore appeared to the Bishop Eudoxius and informed him of the Emperor’s plan. He then ordered the bishop to inform all Christians that no one should buy any food from the markets, but rather eat boiled wheat with honey (a dish called kolyva). As such, Orthodox all over the world make kolyva today in remembrance. Whether it is kolyva, fasting, big feasts or the bread and wine that becomes the Body and the Blood, food plays a very large role within the rhythm of the Orthodox Christian life. Thus, even though it can be a bit fiddly, I can’t help but think about how food affects my RPG worlds through culture, trade and even politics. In my Lost Colonies campaign, through character action, there are two food items that Headwaters will be known for — camel cheese and stirge (of all things). The former is due to the cheese factory Pawnshee financed, coupled with the party bringing a female camel and giving it to the father of Dn. Goram and Hamlen. The stirge will become a local delicacy once Fidgewik the Toadman (now “Gnome”) finds a decent supply of stirge meat. Both of these imply a culture surrounding these foods. Stirge can’t really be domesticated (can they?) therefore whatever supply must be hunted. As camels become numerous in order to deal with the demand for camel milk, how much will they displace cows and horses? Personally I find these thought experiments fascinating and they make my campaign world come alive — because of food. For another example, I used random tables from the Ready Ref Sheets from Judges Guild to determine some normal flower and fauna for various regions of my version of Averoigne. One tree that kept coming up again and again is the sassafras. Thus (in contrast with the regions around it), the most common alcoholic drink in Averoigne is root beer. Due to the preponderance of sassafras trees, it is something that the common folk can easily make themselves and can be sources of local pride. Drinks like wheat beer and wine are understood to be either drinks of the aristocracy or of foreigners. Want to reveal yourself as an outsider? Order a glass of wine at the local tavern. It doesn’t seem to matter much and it is fiddly, but thinking about food and its cultural, political and economic impact on a campaign world can really bring a world alive in a way that ignoring food or treating it abstractly cannot.